The kit contained a cab, beads, findings, needle and thread and instructions. The cab isn't in the picture below. For the sake of fairness, I'm going to discuss this kit in two parts... the instructions, and the beads/kit. First off, the instructions: These were excellent, the design is pretty, the instructions were clear, well presented and well explained. I didn't agree with their suggestions to put glue on knots instead of weaving in the ends, but for an inexperienced beader, that is OK. Unfortunately, that's about all the good things I have to say about the kit. The beads were of a shockingly poor quality, totally irregular in size and shape... and I'm sure I'm not just saying this because I've become accustomed to the high quality of Japanese seed beads. Also, the large, pale-blue lined beads were just a horrible colour - not at all similar to the photo on the front of the kit. The needle supplied with the kit was totally inappropriate for the type of beading too... it was one of those 'big-eye' needles, which are only really good for stringing, and not for bead work like this. Also, I've no idea why there were ear-wires in the bag of findings... there were no earring instructions! Another problem I had was with the thread - it was a spun thread, not woven, so it tangled and twisted up really quickly... so quickly in fact, I quickly gave up and used my own Nymo. By far and away my biggest problem with the kit was the cab. For the design, the cab was not of the correct dimensions. Although I beaded with my usual crazy tension, the netting was just too baggy/large for the cab. The pattern started off at the back, and ended up having to cover quite a large part of the curved front, just to keep it from falling out. I can't even bring myself to photograph it to post on here, because it looks like one of the most terrible pieces of beading I've ever done! I am really on the verge of taking the entire kit back and asking for a refund... Has anyone ever taken a kit back to a shop because of this sort of problem? This picture is of a stone cab (can anyone tell me what stone? Please? 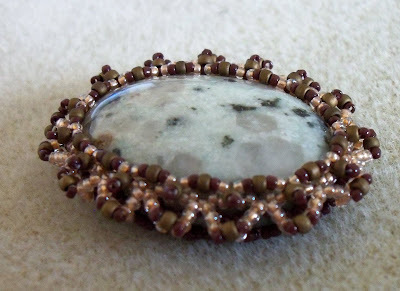 ), and the bezel is made with a mixture of Toho and Miyuki seed beads in sizes 11/0 and 15/0. 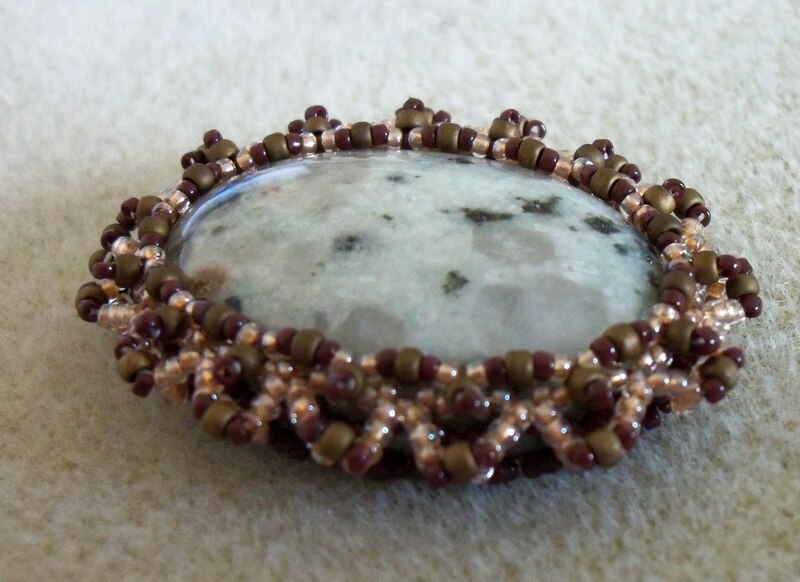 With the help of some of my beading friends, I've decided that it needs a beaded rope to go with it, and that rope is going to be a 7 drop beaded netting rope... once I've beaded it, I'll add a photo! I think that is an Agate, Becs, but I can't narrow it down from there, sorry! That sounds like a terrible kit experience!!!!!! Gorgeous work on the cab, though, I love what you did with it! Thanks Nancy... do you think I have any chance of a refund?? I wish I could get it to show up in the photo, but the cab is so gorgeous - it's a pale green-grey with clear/grey crystals in it... it has amazing depth, I wish I was a better photographer!